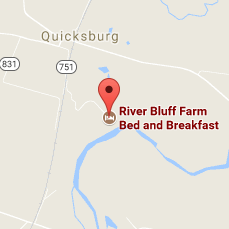 Sleep in a beautiful queen four poster bed in this lovely first floor room with a hardwood floor and views of the Massanutten ridge and the North Fork of the Shenandoah River. Pamper yourself in the two-person rain shower in the private bathroom. All rooms have Wi-fi for staying in touch. Central heating and air conditioning keep you comfortable year round. Rates range from $110 to 149.